In a recent post I argued that many of the Eurozone’s current problems stem from low nominal wage inflation in Germany before 2008. In that post I also noted that this could be justified if Germany had entered the Eurozone at an uncompetitive real exchange rate, but that I thought there was little evidence for this. I want here to expand on that point. One area that I have worked on extensively in the past is what might be called the empirical analysis of equilibrium exchange rates. The term equilibrium is short for where the real exchange rate is heading over a five year or so time horizon. While predicting exchange rate movements from day to day is impossible, this is not the case over the longer term. It was for this reason that the UK Treasury asked me to analyse what an appropriate entry rate for Sterling might be if we had joined the Euro in 2003. There are two ways of describing the approach I take in this analysis. The first is to calculate the exchange rate that will achieve ‘external balance’. As John Williamson repeatedly points out, external balance does not mean current account balance, but the current account that is consistent with medium term trends in domestic supply and demand. This is why the approach is equivalent to a second way of describing it, which is to apply the ideas of the ‘new open economy’ literature that now dominates open economy macro. In a 1998 study with Rebecca Driver for the (now called) Peterson Institute (which contained a key contribution from John Williamson and Molly Mahar) we calculated equilibrium rates for 2000 for France in the range of 3.06-3.74 Fr/DM, and Italy 927-1133 Lire/DM. The actual entry cross rates were 3.35 Fr/DM and 990 Lire/DM, which is pretty close to the middle of those ranges. In other words, according to our analysis Germany did not enter at a significantly uncompetitive rate compared to these two major economies. A crude way of doing exactly the same analysis is simply to look at the current account balance. Here it is for Germany, as a percentage of their GDP. The problem with this simple approach is that the current account is a noisy signal, and it is exactly this problem that the analysis described above tries to deal with. 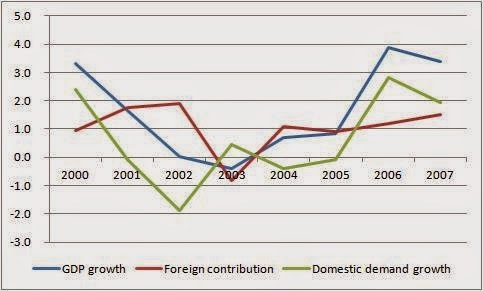 But for the sake of argument let’s say that, because of well known lags, the current account in 2001 reflected the competitive position of Germany when the Euro was created. 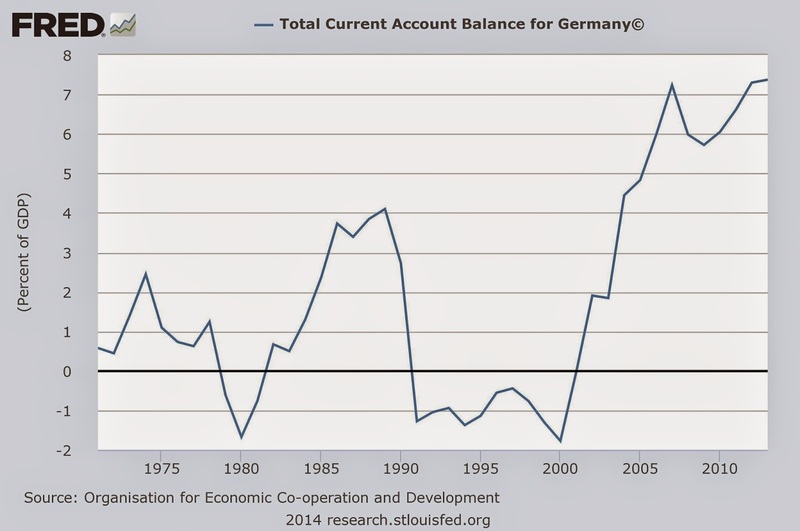 Germany’s current account in 2001 was in balance, and according to the OECD its output gap that year was a positive 0.7%. So Germany could only be uncompetitive on entry to the Eurozone if that current account balance was unduly influenced by one off factors, or that it really should have been running a structural surplus because of relative demographics or some other reason. But such structural surpluses are normally of the order of 1% or 2% of GDP. Looking at the current surplus of over 7% of GDP, you just have to conclude that Germany currently has a hugely undervalued real exchange rate, which is just another way of saying that it is too competitive compared to its Euro partners. It achieved that competitive advantage from 2000 to 2007. So where did this idea that Germany entered at an overvalued (uncompetitive) exchange rate come from? I suspect it derives its force from what happened to German GDP growth after the Eurozone was created. As the chart below shows, Germany entered a recession in 2003. In addition, in 2003 foreign trade subtracted from growth. However in terms of the contribution of trade to growth this was a blip: both before and after export volumes grew faster than import volumes, reflecting the growing competitive advantage it was gaining through low nominal wage growth. (A ‘sustainable’ pattern would have domestic demand growing at the same rate as GDP, with a foreign contribution averaging zero.) So if we consider the period 2002 to 2004, for example, the recession was despite a positive contribution from trade, so trade can hardly have been a cause of it. The real reason for the depressed German economy was a decline in domestic demand, coming from both consumption and investment. Whatever the reason for depressed domestic demand growth, it was not permanent, with healthy growth in 2006 and 2007. By that time, however, Germany had through low nominal wage growth gained a large competitive advantage compared to its Eurozone partners, which was the subject of my earlier post. Germany’s undervalued real exchange rate - its competitive advantage compared to the rest of the Eurozone - cannot persist. It will be eroded by faster inflation in Germany relative to other Eurozone countries. The only question is whether this happens through a boom in Germany, or continued depression in the rest of the Eurozone. Yet failure to see the source of the problem as coming from Germany continues to mire the debate. There is endless discussion of the need for structural reform outside Germany that ‘must be part’ of any solution to the Eurozone’s current problem. Structural reform may or may not be desirable in many countries, and perhaps even Germany, but it has nothing to do with the need to raise the level of aggregate demand in the Eurozone as a whole. As far as competitiveness imbalances within the Eurozone are concerned, the problem is a result of a negative inflation shock in Germany. The natural place to look for a solution is not structural reform outside Germany, but a period of above target inflation within Germany, and it is in the interests of pretty well every Eurozone country other than Germany that this should happen. FWIW, I was speaking to senior policy makers in Germany and elsewhere at this time. The Italian entry rate was exactly what Germany wanted. There was a feeling in Germany that the French franc and a few others were OVERvalued against the DM. Earlier in the EMU process it had been expected there would be a final realignment. But this was rejected by countries like France for prestige reasons. So the cross-rates were not the problem. The period of Germany's "unhappiness with itself", when it was the sick man of Europe and so on, was not in 2003, but in the late 90s. See: http://www.economist.com/node/209559 . I do not recall that there was a concern that the exchange rate was overvalued, though I guess what you are expressing is the monetarist side of the whole the-economy-is-in-slack-we-need-reforms idea. I am not, and cannot completely be aware of what the policy insiders have said though. Your chart even shows that, because the contribution of trade exceeds gdp growth in 2002 already. I guess the feeling of uncompetitiveness was created by the negative current account in the 90s. The upswing began in 2000, that is clear. I would also blame the monetary unification process for that. The Euro was undervalued for Germany and overvalued for many other countries, including France. But as Gobanian said, the French demanded that out of prestige, see also the gold standard and the Great Depression in France. The Germany desire for low nominal wage growth began in the late 90s, the structural reforms then came after 2003, the Hartz reforms, as they are known here. Those are two separate processes, which is why your attempt to merge them is wrong. German policy makers have little influence on wage setting. The biggest reform I can imagine within the german policy setting will actually take place next year, the minimum wage law. But it will not impact Germany's export strength because Germany's highly specialized manufacturing sector pays wages above the minimum wage, so how should policy makers have an effect on that? If, as your chart shows, german demand has ceased to be a problem from 2006 on, then why should german wages rise? Why would labor market reforms like Germany did in 2003 hurt other Eurozone countries? Why should german demand overheat when the more elegant solution that economists should press for now, is a targeted demand increase in the other countries through fiscal policy? Or why not press for helicopter money as a way to generally increase inflation AND demand in the Eurozone? "German policy makers have little influence on wage setting." In my opinion this is wrong. While there is no direct way to influence the wage setting (expect for public services), you underestimate how political power works. It is about setting the agenda and a general political atmosphere. It is a big difference if wage moderation is embraced by both major parties or if it is opposed by one of them. You also underestimate how close the unions and the SPD were in the 90s. In addition wage agreements for a whole sector was a lot more common which means that the wage negoations effected more people and were more political in consequence. Moreover, the public sector set examples like cutting the real wages of officials (often indirectly through increasing the working hours). The general atmosphere was totally different at the end of the 90s. "American-style free markets" had won and Germany was too late to the party. It takes a lot more courage to do what GDL and Weselsky are doing now in such an atmosphere (even today it is very courageous to do) because the public opinion was different (which can be influenced a lot by politics). That made headlines here. At least for that time, a move for higher wages had no power either in society or in politics. The minimum wage law right now is an SPD initiative, but as I said, I don't think that it is going to impact german exports all that much. The sectoral wage agreements are very much part of the german federalist setup. Interest groups are powerful precisely because the government should keep out of it. They shall handle these matters themselves. Couple of interesting points there, but I have to admit that I’m simply not getting Professor Wren-Lewis' key statement. What do you actually mean when saying that Germany is the problem? See, common sense would conclude that Germany did the right things and Club Med didn’t, so if there’s someone to change its ways, it’s the latter group. "See, common sense would conclude that Germany did the right things and Club Med didn’t, so if there’s someone to change its ways, it’s the latter group." That is what I am refering to when I talk about differences in goals regarding EMU below. Until Professor Wren-Lewis addresses those, I think the debate will not make headway. Prof. Wren-Lewis seems to see the need for a permanently engineered balance in competitiveness. The results (=the balance) will depend on negotiation power of the individual countries. What you seem to prefer is a self-regulating EZ. The balance will depend on how low a country is willing to go in wages. It will force everyone else to go along, sooner or later. I would claim that the later iis the more capitalistic approach, the former involved planning/engineering of the EZ economy. That, however, does not necessarily mean that it is the wrong approach. But Germany did "the right thing" while Club Med was having 4-5% wage inflation. Germany does not accept that, so the South should DEFLATE wage s for many years. Which destroys internal demand and create permanent depression. This just doesn't work. That's one of the reason why the current eurosystem is unsustainable. Funny how you and others treat Club Med's real wage inflation as something which just 'happened', like the sun going down each evening. -while the Eurozone economy as a whole was in decent shape. -while the Eurozone as a whole is hugely depressed. THIS WILL NOT HAPPEN. It's just NOT POSSIBLE. Not moralizing, just stating FACTS. marco, i think that wages in the South can go down, but the problem is that without inflation it will be a painful process as wages are sticky on the down side meaning that this generally happens only with lots of unemployment. I still think that the ECB can helicopter in money to restart the economic engine by writing checks to everyone in the euro-zone. Rob Sol, I agree 100%. Which leads me to believe that, as the Germans will never accept helicopter money, the eurosystem cannot survive in the present form. I am German, subscribing largely to ordoliberalism, and I fancy the chances for German public assent to helicopter money much higher. But only as a one time event. If southern countries need to be propped up regularly, the Euro system will fall apart. It will fall apart anyway. The euro system doesn't make any sense. "interests of pretty well every Eurozone country other than Germany that this should happen." So true. And in my opinion even in the German interest in the medium and long-term since I do not believe this situation is sustainable. In my view too many people still consider Prof. Nonsense et al. as having an opinion which is worth considering. He just repeated "there is no alternative to deflation in the south" since every other policy could compromise the price level in the whole euroarea. Funnily, Mark Schieritz just found a one of his papers from 2000 including the reference: "the euro-11 countries need an aggregate inflation target of about 2.5% or more" (given 1.5% inflation in Germany) "to allow for a decline of relative prices". It is pure nationalism what these guys are doing. In his debate with Munchau he said that we should let the banks fail and that we need more "Schumpeterian ideas". While I do think a tighter banking regulation is need (i.e. more equity (see Hellwig et al.)) the idea of an Austrian purge and binge in the current circumstances seems crazy to me. It is also quite funny since if there is one economy which is NOT Schumpeterian than it is the German. I my opinion the self-interests of the national banks in the eurozone are not considered enough. The Bundesbank has never accepted that it is “not calling the shots” any longer (which can also be seen in the fights over the Bafin/Bundesbank fight over banking regulation). In addition the Banque de France seems to have a lot of self-interest when it is questioning the asset purchases on the ground that it is done by asset managers. Large bureaucracies, corporate or governmental, do not vanish. They fight for their survival or for a new role. "Structural reform may or may not be desirable in many countries, and perhaps even Germany, but it has nothing to do with the need to raise the level of aggregate demand in the Eurozone as a whole." This is VERY right. "The natural place to look for a solution is not structural reform outside Germany, but a period of above target inflation within Germany". But this would take years and Germans are never going to accept it, anyway. Clean up the banking sector, this should take a lot of uncertainty out of the markets. Demand will rise. Let nationalization be the substitute for bankruptcy of TBTF banks. Monetize any costs of nationalization. Wipe out shareholders, protect savers. And I advocate that as someone who favours ordoliberalism. Helicopter money is not acceptable to me unless the banking sector gets a scrub. Simply handing out more "baby-sitting coupons" is the lazy man's answer. The solution must be to single-out the reason for the fall in demand and address it. Yes, this effort *may* be assisted by handing out more baby-sitting coupons for a while. But on its own, it strikes me as poor response. The world is not an aggregate demand chart; things happen for a reason. The reason for the fall in demand in Southern Europe is very clear; huge increase in taxes, totally self defeating as they cause consumption, production and government revenues to collapse. Reverse this with helicopter money and demand will increase immediately. Cleaning up banks does not restore demand as individuals and enterprises are scared and don't want to borrow. But much of the western world has seen a fall in demand. Why? Because of uncertainty. Also, the fall in demand in southern Europe cannot be explained only with austerity policies, that's just a too convenient explanation. The steady rise of NPLs is surely a huge factor contributing to uncertainty. And in Spain in particular this is not merely the result of tax increases but of a housing bust, it seems to me. Fall in demand was there in other countries, sure. But the eurozone from 1999 onwards is 10% below UK's trend (and UK wasn't an outperformer. But is out of the euro...) It means 1.000 BILLION in lost GDP PER YEAR. The difference between UK and Italy is mostly about population growth and flexible labor markets. UK has high immigration, population growth is responsible for GDP growth. At the same time though real wages are falling in the UK, therefore living standard is dropping. Taxes on labour being reduced could be funded by a land value tax. I agree with the analysis. Germany did not enter EMU with an overvalued exchange rate. You can also see this by simply looking at the Bundesbank's indicator for the international price competitiveness of the German economy (the effective real exchange rate) which was close to its long-run average in late 1998. However, similar to Alexander Sebastian Schulz, my recollection is that overvaluation was not a very prominent argument in discussions at that time. Definetly, I was not decisive for implementing the labour market reform program of 2003. Although it might seem odd from today's perspective (and deeply in contrast to what international observers currently write quite often), (re-) gaining international competiveness was not the concern of the labour reform program. It was simply not discussed in these terms! It was aimed at correcting flaws of the welfare state and "activating" (that was the term used) the unemployed. Indeed, even the dampening effects the reform had on wages came unexpected for most politicians (and possibly also economists). In recall talk-shows on TV at around 2004/2005 with politicians in deep doubt about the beneficiary effects of the reforms (they are still in doubt today, but somewhat less now), argueing that it would be unfair to cut unemployment benefits when no additional jobs in sight. The link between reforms and wages simply was not clear to many of them! This not say that the reforms did not cause repercussions in the rest of the euro zone. They clearly did. But that was neither intended nor fully foreseen at the time. Anyway, without the boom bust-cycle in the periphery countries, we would probably not care about the German labour market reforms of 2003 very much today. "Without the boom bust-cycle in the periphery countries, we would probably not care about the German labour market reforms of 2003 very much today." Sovereign debt crises, austerity, EMU crises. None of which would have taken place in a flexible exchange rate environment. The southern credit boom is the result of narrowing bond spreads which began in the mid to late 90s in expectation of EMU as Professor Sinn showed nicely in his presentations. It was a time of many illusions. These illusions have burst now. But the credit came from Northern Eurozone countries willing to provide vendor financing and to reinvest trade surpluses. German deflationary labor shock made it possible, flex echange rates would have avoided it. 1. The capital inflow came from all over the world, not only Germany. The difference for American, Chinese, British investors etc. now is that only the Northern European taxpayers have to take part in the bailout and debt mutualization programs (ESM,OMT) to pay these credits back. 2. The narrowing of the bond spreads was the results of the capital markets anticipating that all debt would eventually be mutualized between all EMU countries, through the periphery's political negotiation skills. the credit boom will not come back, therefore the imports surplus based upon this money flowing to Spain will not return either. What evidence do you have that wage increases in Germany would make much of a difference for Spain? I highly doubt they would because the credit bubble will not return and Germany is only responsible for 15% of exports. A currency devaluation compared to all other countries, eurozone and non eurozone, would probably help but will be a blow to Spanish living standards. Any workable solution will be painful, the idea that just Germany with some wage increases can help Spain out of it's misery is probably a dream. "A currency devaluation compared to all other countries, eurozone and non eurozone, would probably help but will be a blow to Spanish living standards." Not really, as devaluation imply a very modest pass through to internal inflation (especially starting from the current situation, where a huge output gap - ie unemployment - exists in the periphery). "The credit boom will not come back": it wouldn't be the appropriate solution anyway. What the periphery need is monetary-financed deficit spending. None of which would have taken place in a flexible exchange rate environment." True. And it would not have happened if France and Italy had taken German advice in 1989 to 1992. Chancellor Kohl declared in a speech to the Bundestag that monetary union could not work without political union, i.e. a common discal policy - something most macroeconomists are agreed on today. (SWL's alternatives are not workable.) Germany was then willing to sacrifice its sovereignty for a European political union. France's and Italy's governments insisted on monetary union without political union, and their countries are now suffering for that. If Germany was right then, what reason do we have to believe it is wrong now? Monetary union is wrong, with or without political union. The eurozone is just not an appropriate currency area for a monetary union. first you would need to show us how exactly this above target inflation in Germany is going to happen. But even if we assume that it does happen, it's not a given it will do anything to change the competitiveness imbalances you talk about. Germany will continue wage moderation, move jobs to lower wage satellite countries in Eastern Europe or increase productivity, basically they will try everything to remain competitive. How will this help the periphery? To paraphrase the US finance minister in the 70s (about the $): our exports are your problem, not ours. And they are right, let me ask you this: what are the trade imbalances between US states? Nobody knows, nobody cares. The US federal model isn't about trade imbalances, but capital flows (fiscal transfers) and labor migration, and the US states that still can't manage, too bad for them (and they can't solve their problems with debt, like some eurozone countries are trying). As this model has proven to work, this is the only sustainable road ahead for the eurozone. Navel gazing about internal trade or competitiveness imbalances is a waste of time. "Yet failure to see the source of the problem as coming from Germany continues to mire the debate. [...] As far as competitiveness imbalances within the Eurozone are concerned, the problem is a result of a negative inflation shock in Germany." It still seems to me that there is a conflict in goals more than there is in perception. Perception follows vision. The view that German economists tend to endorse is that other EZ countries should have followed suit back then and now must make up for it. Your goal is apparently to create a permanent state of some artificial balance in competetiveness within EMU. The goal of other economists is, as far as I can see, to have economic pressures force countries to behave in a manner that will result in some form of balance on its own. From this goal conflict, differences in perception regarding the crisis arise. And with that comes forth the question of whether internal devaluation within a currency union is a legitimate way of competition or illegitimate and harmful beggar-thy-neighbor policy. Whether internal devaluation within a currency union is a legitimate way of competition or illegitimate and harmful beggar-thy-neighbor policy is an interesting question. But is largely theoretical. "As they (the Germans) see it, their economy was in the doldrums at the end of the 1990s; they then cut labor costs, gaining a huge competitive advantage, and began running gigantic trade surpluses. So their recipe for global recovery is for everyone to deflate, gaining a huge competitive advantage, and begin running gigantic trade surpluses. You may think there’s some kind of arithmetic problem here, but in Germany they have their own intellectual tradition." I was really angry when Krugman said that. It's not the recipe for 'global recovery', only for Eurozone recovery. And no matter what one's opinion on that policy is, it IS arithmetically possible. That was a pretty cheap shot by Prof. Krugman. alexander, sure if some countries do it, it is possible. But that means some countries have to accept a larger trade deficit. Which ones would be happy to be the engine of growth for Europe? Actually almost all EMU countries run current account surpluses, as does the eurozone as a whole. Among the biggest deficit nations are the US and the UK. As I said, opinions on that policy may vary. But Krugman just made that argument up. Very bad form. Indeed, the goal of German advice here is not aimed at boosting the global economy. It is Prof. Krugman and Prof. Wren-Lewis who at times tend to look at world affairs from this angle. The German advice is aimed at getting crisis EZ countries more competitive versus the rest of the world to overcome their current economic woes. What this may or may not do to other countries is a completely different question. i am not sure what you mean by increased competetiveness except to have a competetive advantage in your currency. What does Germany recommend for non-EZ countries; should they not follow the same strategy? . "But increasing competetiveness in deficit countries will help things peter out." What does that mean? It's absolutely impossible for Southern European countries to follow Germany's advice. It means that if other nations manage to boost their economy through gains in competitiveness, their current account deficit will shrink or turn into a surplus. As they bite into Germany's market share, the German surplus will be reduced. This is an acceptable way to reduce trade imbalances from a viewpoint of ordoliberalism. If a non-EZ country wants a hard currency, they should follow the same strategy: try to offer the best prices they can for the products they can offer, if necessary through internal devaluation. If they do not want a hard currency, there is other options to choose from. indeed: using your currency for competitive devaluation. I think they joined the eurozone for a reason: they don't want this anymore. Nevertheless it might be the only solution for them. What I don't understand is why some present competitive devaluation as something wonderful. I would think it's the outcome of a failed economic strategy to become competitive, not some road to improved prosperity. Well, some people here in Germany belief that the financial liability of Germany is probably just 25.000 €. Otmar Issing published a sweetly reasonable defence of Germany's economic policy in the FT on Oct. 30. What about a post dissecting it sentence by sentence. That would make clear where your differences are in detail - since you will obviously disagree with him. I found him quite convincing.